It has been said that “All roads lead to Rome” and this morning as I awoke, truly my very thoughts turned to Rome. To the many visual and epicurean feasts for the eyes and palate, but also to those moments which speak to our very soul. At one time distance itself was measured in proportion to Rome, to the Milliarium Aureum, a monumental marker erected by Emperor Augustus centrally placed in the heart of the city. Dependent and connected through the well constructed Roman roads there seemed little way as a traveler to avoid passing through this jewel of the Empire. Today, we are beckoned here still, to walk in the footsteps of the saints and martyrs that have gone before us and to see where this road is continuing to lead us as a people of faith. 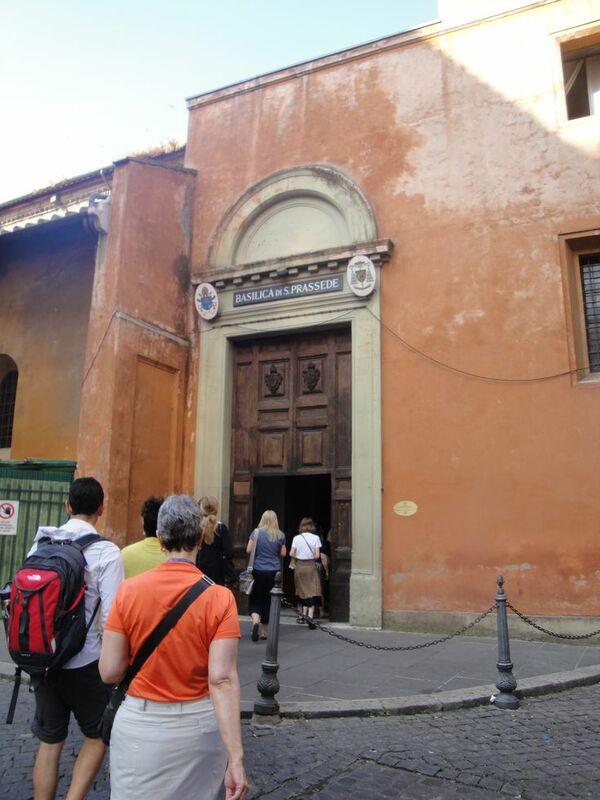 With this in mind, I wanted to invite you to reflectively join me on my last pilgrimage to Rome, as part of a series, and to share your insights and impressions as well from each of these incredible sites of early Christianity. While I am certainly not a noted historian or an archaeologist by trade, I am more accurately termed a theological pilgrim. Moreover, since no discussion of Rome is complete without reminiscences of the incredible food, people and surprises along the way that one encounters, be prepared for these fun diversions too! One such experience can be found in an earlier post entitled “A Spirit Led Day”. 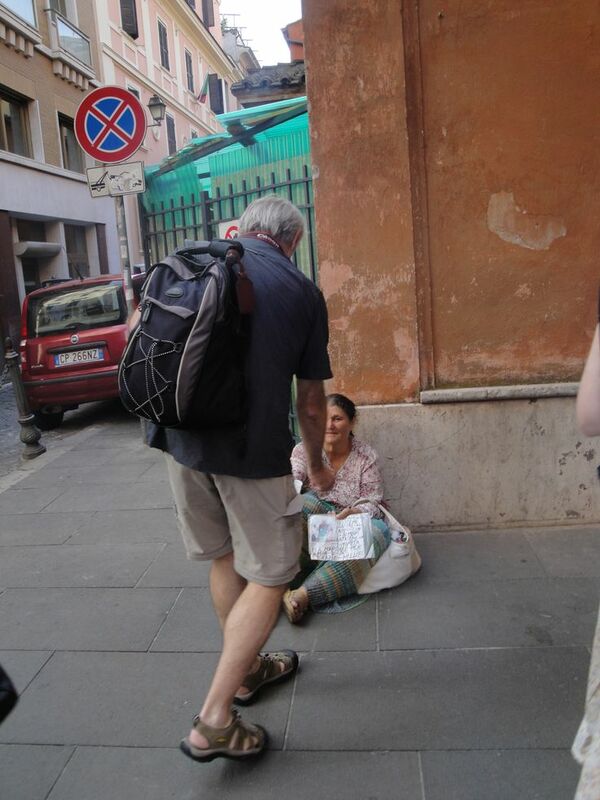 That morning, as my friends and I gathered outside, we were met by the gaze of one of Rome’s poor, disabled elderly. With one foot bound and misshapen, she sat rather motionless and quiet. That is, until Fr. Steve came close! Upon entering, my eyes were amazed at the splendid array of brightly colored paintings and golden mosaic images that filled this 9th century Byzantine church. First, above the altar is an incredible apse depiction of the presentation of St. Prassede (Praxedes) and Prudentiana to Peter and Paul at the river Jordan with Jesus. Here too, you’ll see Pascal I , the then pope surrounded by a square blue halo indicating his assured sainthood upon his death, presenting a model of the church. 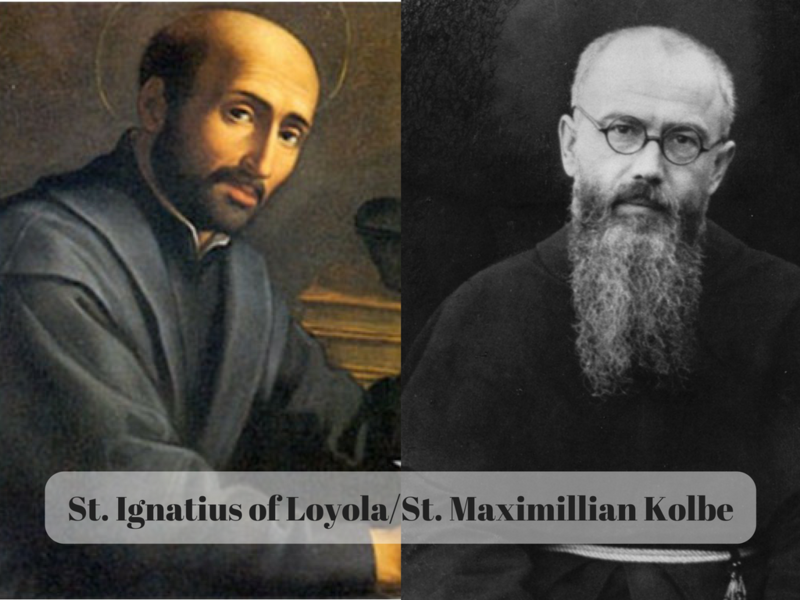 What is so endearing about this is that we can see that despite being separated by centuries, this continuity of faith, tradition and call to sainthood in our own discipleship. Interestingly this church is said to hold not only the remains of Sts. Prassede and Prudentiana, but also the remains of many Christian relics from the catacombs that were moved when invaders sought to take control of the area. As you enter the funeral chapel of St. Zeno, you are prompted for a small euro donation to which the room is suddenly lit with a soft ambient light. Definitely worth the small price, beauty and holy silence envelopes the entirety of this space. 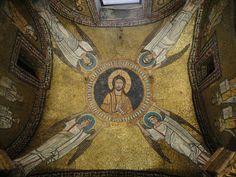 Above you, you’ll see an image of Christ supported by four angels. 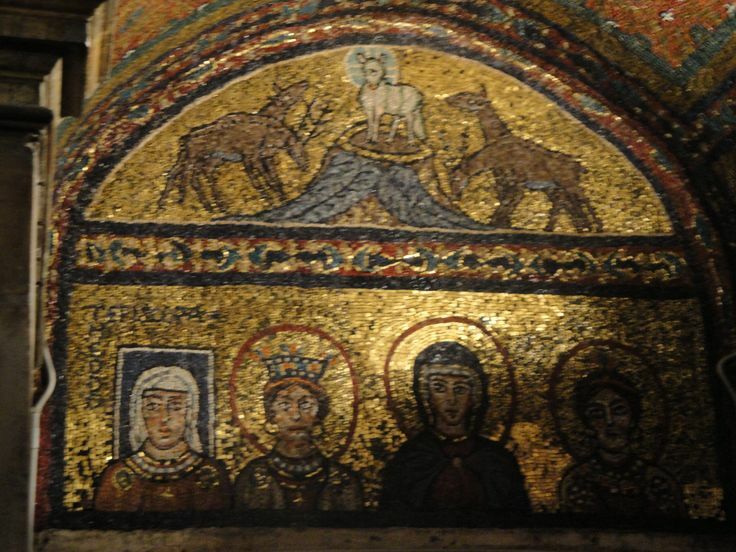 Above one doorway are the portraits of Pope Paschal’s mother Theodora (with square nimbus indicated she was living at the time), Prassede, Pudenziana, and Agnes. On the outside doorway is another storytelling mosaic featuring Mary with child, the apostles Peter, Paul James, John and Andrew and Sts. 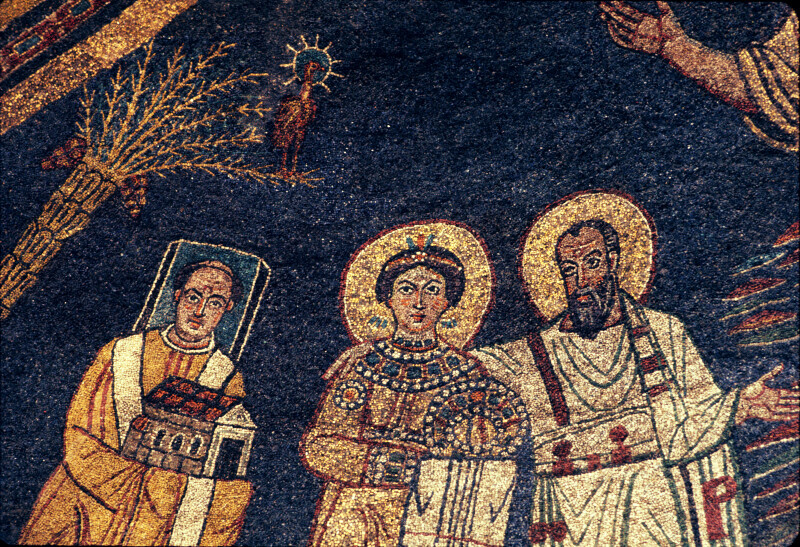 Prassede, Pudenziana, and Agnes. 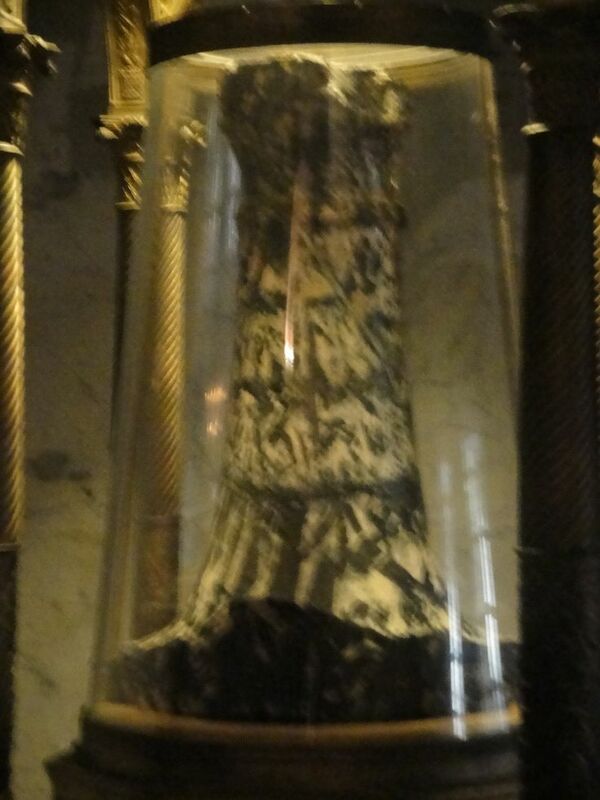 Also contained within this church is the pillar of black granite that Christ is believed to have been tied to and scourged upon, brought to Rome in 1223. Amid this splendor, however, I must note the breathtaking crucifix that left me speechless and remains with me to this day. 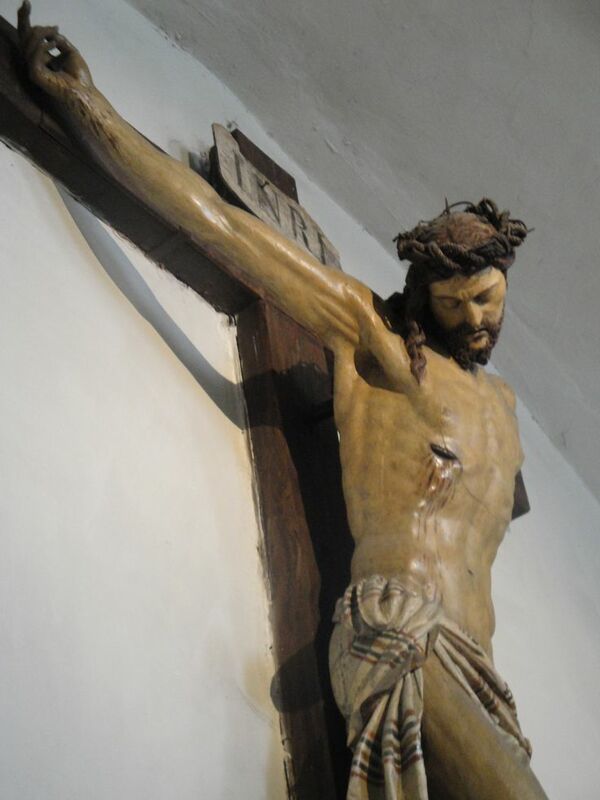 Tucked away in a side chapel, is this almost life size and lifelike crucifix that is said to have spoken both to Sts. Bridget of Sweden and Francis of Assisi. Here at the feet of Christ I stood, knelt and prayed as countless others before me have done. Yet, in this holy moment I was no longer an onlooker, a spectator of the history that lay before me but a living testimony of the faith. 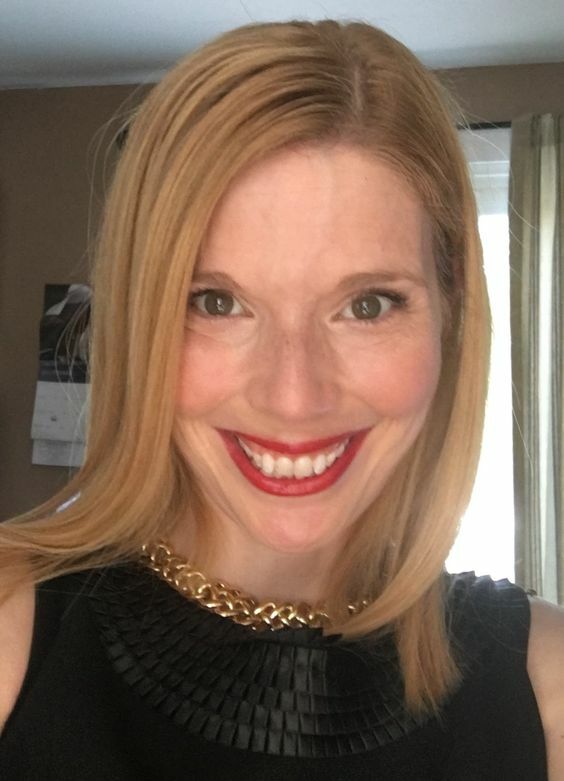 Called to Christ, I too had been inextricably linked to a breadth of tradition and set upon this incredible path to witness his presence in my life today. 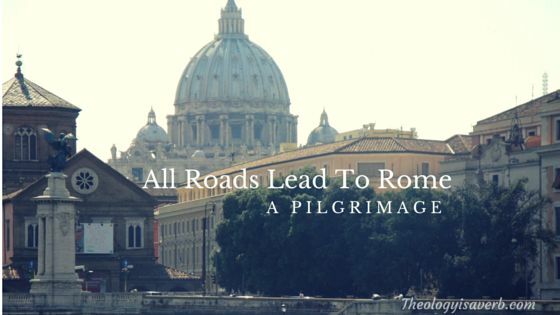 Have you been on a pilgrimage to Rome before? If so, what are your favorite sites? Is there significance in your own faith life to the lives of these early Christians? If not, might I suggest a pilgrimage..even a virtual one?